With one of the most powerful first lines I’ve read (“Dear God, would you please kill my daddy? Amen”), Seeking Shelter pulls no punches as it shows how one woman, Megan, grows from a down-trodden, abused wife to a confident, secure woman. 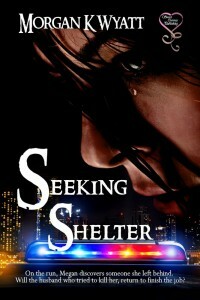 Seeking Shelter isn’t at its heart a romance (though there is the relationship she eventually develops with Kevin, she doesn’t even meet him until nearly one hundred pages into the story); it’s a suspense novel with the bones of women’s fiction. The strength of the story is in its characters. We meet a crew of folks who are so incredibly developed, unique and interesting, they’ll keep you reading even when the plot hits a bump. The bumps are very small, and the story is thoroughly interesting. The children broke my heart at the beginning, but it was lifted as I watched them change and grow with the kind of resilience only the very young seem to have. Megan struggles to overcome her fear… and who could blame her? She was all but held prisoner by her husband and abused verbally and physically. We’re meant to hate Jason, and we do. Kevin was exactly what our heroine needed. Soft-spoken, calm, a little bit unsure, he’s the complete antithesis of Jason. Don’t think he’s weak, however. We find out just how strong he is before the last page. I’ve not read anything by this author before, and despite my few issues with some of the plot points (and the ease with which the ends are tied) I was truly amazed at her skill with words and character building. I’d not hesitate to pick up another book by Ms. Wyatt, and really did enjoy this one.